The Jacka (Born 1977) is an American rapper from Pittsburg, California. 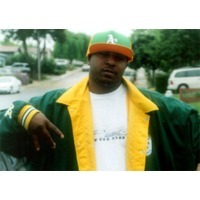 He began his career with the Pittsburg group Mob Figaz, whose first album, C-Bo's Mob Figaz, was released in 1999. He currently runs his own label. His new project entitled "Broad Daylight" consists of 14 songs Jacka won Ozone's patiently waiting award in 2008. The Jacka also converted to Islam and changed his name to Shaheed Akbar. Jacka currently runs his own label entitled The Artist Records.